We have over 4,000 veterinarian, breeder and animal research clients, and are the largest, most respected company in the field of animal Holter and cardiac event monitoring. 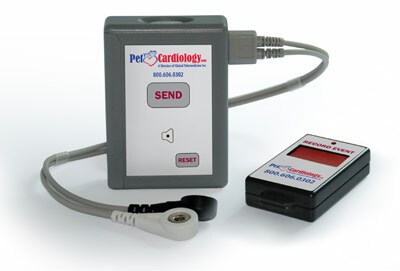 Thank you for your interest in the PetCardiology/CardioPaws cardiac monitoring service. We provide "state-of-the-art" monitoring devices for 24/48 hour Holter Monitoring, and attended Event Recorder Monitoring 5:00am - 5:00pm M-F (pacific time) to assist in detecting potential pet health problems. With over 20 years of cardiac experience and a reputation for accuracy, we are trusted by veterinarians, veterinary cardiologists, and breeders across the country. PetCardiology has surpassed competitors by focusing on providing our clients with the best that technology has to offer, and by refusing to surrender to the "big corporate" structure and mentality that is so prevalent with today’s services. Your needs are important to us and we will structure a service designed around your busy practice...not ours. PetCardiology will never "autoscan" a Holter. Auto scanning (which some companies rely on simply because it's cheaper than having to hire a trained professional to interpret the ECG data) relies on a computers algorithms to make decisions on how beats are determined. It takes human intervention to accurately diagnose even the smallest abnormalities.This is especially true when analyzing patients with pacemakers. You may pay a company less for the results but, you get what you pay for. All Holters are scanned using high-end Holter scanning computers which contain superimposition software, This is the most accurate method for analyzing Holters but also the most expensive. We will include a 24 hour full disclosure which often isn't provided or is provided for an additional fee. For multiple studies, if the Holter is repeated within 6 months, we offer a 50% discount. We also discount for special studies and for projects involving grants. We use Del Mar, Spacelabs and Biomedical software. Over the years we have used some of this software for multiple Holter studies which we were contracted to analyze such as for the National Institute of Health ...so you know the equipment we have needs to be completely accurate, test after test.